NEW YORK - Iranian President Mahmoud Ahmadinejad clashed with an American university president who called him a "petty and cruel dictator" at a forum on Monday where Ahmadinejad criticized Israel and the United States and said Iran was a peaceful nation. Introducing the Iranian president, Columbia University President Lee Bollinger said Ahmadinejad behaved as a "petty and cruel dictator" and that his Holocaust denials suggested he was either "brazenly provocative or astonishingly uneducated." Ahmadinejad rose after the introduction, and after a religious invocation, said Bollinger's opening was "an insult to information and the knowledge of the audience here." "There were insults and claims that were incorrect, regretfully," Ahmadinejad said, accusing Bollinger of falling under the influence of the hostile US press and politicians. "I should not begin by being affected by this unfriendly treatment." Ahmadinejad also said in an appearance at Columbia University that Iran's nuclear program was purely peaceful, and his country was a victim rather than a sponsor of terrorism. Challenged over his past comments that Israel should be wiped off the map and questioning the Holocaust, he said his concern was for Palestinian suffering. Ahmadinejad, who was in New York for the UN General Assembly, received a caustic welcome at the Ivy League university, which had come under fire from critics who said it provided a platform to a Holocaust denier. Security was tight at the hall holding around 700 people, 80 percent of them students. Bollinger asked a string of pointed questions, most of which Ahmadinejad ignored in a speech that dwelt at length on science as a gift from God and the importance of using knowledge and learning purely and in a pious way. 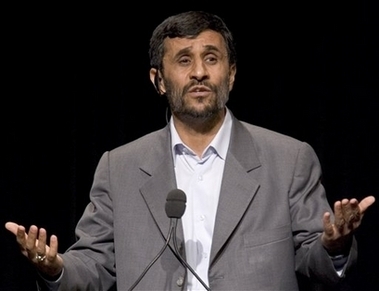 Asked about his views on the Holocaust, Ahmadinejad said "a different perspective" was needed given the impact on the Middle East of those events. Six million Jews were killed in the Nazi genocide of World War Two. "I'm not saying that it didn't happen at all," he said. "I said, granted this happened, what does it have to do with the Palestinian people?" Sen. John Kerry, a former Democratic presidential candidate, said: "Calls for 'research' and 'study' don't change the fact that this man is a Holocaust denier who trades in anti-Semitism. It is long past time for the world to renounce this bigoted revisionist history." Ahmadinejad also rejected criticism of human rights in his country, notably persecution of homosexuals: "In Iran, we don't have homosexuals like in your country," he said, drawing loud laughter from the audience. Protesters thronged the streets outside holding signs reading: "Pure evil" and "Hitler lives?" One man's sign said: "You liar, denier, I'm a holocaust survivor.". In Washington, Senate Minority Leader Mitch McConnell, a Kentucky Republican, was among many who denounced Columbia for giving Ahmadinejad a platform to speak. By opening its gates to Ahmadinejad's "hateful" ideology, "Columbia University is offering him a golden opportunity to spread it," McConnell said on the Senate floor. Esther Lifshitz, 20, a Columbia University student and member of a campus Jewish group, said it was a "tragic irony" that Ahmadinejad was speaking at Columbia, while institutions in his own country don't have the same academic freedom. Earlier, Ahmadinejad took aim at Israel. "We do not recognize that regime because it is based on occupation and racism. It constantly attacks its neighbors," Ahmadinejad said in a video news conference from New York with the National Press Club in Washington, citing recent Israeli military action in Syria and Lebanon. "It kills people. It drives people from their homes." He also took a swipe at Washington: "We oppose the way the US government tries to manage the world. We think this method is wrong. It leads to war, discrimination and bloodshed." But the Iranian leader played down talk of conflict with the West over Iran's nuclear program, which the United States says it is using to try to build nuclear weapons. "We think talk of war is a propaganda tool. People who talk have to bring a legal reason for war," he said. Ahmadinejad is a vocal opponent of US policies but ultimate responsibility for shaping Iran's nuclear policy lies with Supreme Leader Ayatollah Ali Khamenei. New York police last week denied Ahmadinejad's request to visit the World Trade Center site of the September 11 attacks. He said on Monday he meant only to pay his respects.